Very few people just sit and think. Most of us eventually take action. You might think of something to buy at the supermarket, but then you buy it. You might plan a new strategy for an electronics company, but then you implement the strategy. Often we assume that action is easy and obvious—that thinking lays out the roads and decides which road is to be taken and that action is as simple as walking along the correct road. Some people do seem to have a natural flair for action, just as some people have a flair for thinking and for creativity. Such people benefit greatly from some additional training. For those without a flair, training is essential. I spend a great deal of time in the education world and am involved with the largest program in the world for the direct teaching of thinking in schools (the CoRT Thinking Programme). Too often education is about description and analysis. That is the academic tradition, and they are easier to teach than teaching how to act. But the real world involves action as well as knowledge. That is why I invented the word operacy, which is the skill of action. What will happen if we take this action? Will it be acceptable? Do we have the resources to do it? How will people react? How will competitors react? What can go wrong? What are the potential problems? Will it continue to be profitable? These things are part of 'pro-active' thinking, not the usual 'reactive' thinking. The word operacy has the same base as the word operations. Operacy is just as important as literacy and numeracy. This book has very much to do with operacy. The framework of the six action shoes is a help both in the training of action skills and also in the use of those skills at the moment of action. "Be perfect," "Do the right thing," are instructions that are easy to give—but such instructions have I little practical value. 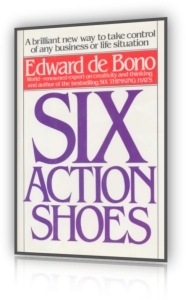 By breaking down action into six distinct modes, the six action shoe framework gives specific guidance about the action that needs to bee taken. When you cook, you choose your ingredients. In action you can choose your action style to fit the needs of the occasion. Purpose of the action is to get information. Also see information challenges. The person is not acting in his or her own capacity but in an official role. In practice, situations are rarely pure examples of one or another action mode.